Hello! My name is Megan Harms, and I live in my hometown of Luling, Louisiana (about 30 minutes outside of New Orleans) with my husband and our daughter and son. I love all things Disney – the movies, the parks, the music, the musicals, and Walt himself. But mostly, I love the sheer creativity of it all. I am a theatre director and designer, and I think what I love most about the Disney parks is the elaborate storytelling and knowing that guests are immersed in a show the moment they walk in the park. A favorite memory of mine was performing as a dancer in Disney’s The Hunchback of Notre Dame Festival of Fun Parade when the film premiered in New Orleans in 1996. 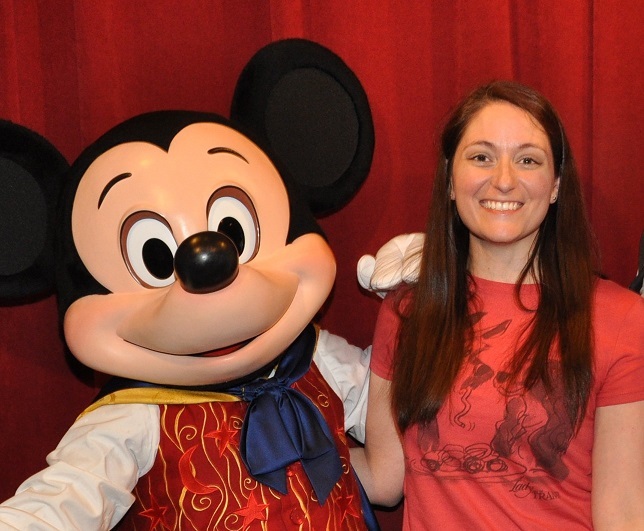 I loved working with The Mouse then, and I am thrilled to do so again! One of my hobbies is reading Disney blogs, researching Disney trips, and pretty much absorbing any Disney knowledge I can get my hands or eyes on! For years, I have been the one my friends and family go to with questions about Disney, especially Walt Disney World. I have even evacuated from a hurricane to where else? Walt Disney World!! It is probably fitting that I wrote a book in the eighth grade entitled Inside the Magic: Megan’s Guide to Walt Disney World. I’m not kidding. If I thought I was an expert then, imagine how much more I know now! I would love to help you plan your Disney vacation, from deciding when to travel and where to stay, selecting experiences that meet that needs of your unique family, and ensuring that your trip is as magical as can be! I specialize in budget-friendly Disney and helping you find ways to get the most for your money. I love organizing my family’s Disney itinerary, and now I get to share that knowledge and experience with you! Chances are, I will be just as excited as you are about your vacation which means that I will go above and beyond to help you experience the trip of a lifetime. Whether you are interested in Disney World, Disneyland, the Disney Cruise Line, Aulani, or Adventures by Disney, I would love the opportunity to guide you through the planning and the preparation. Contact me today with any questions and let’s make some magic! Connect with Megan on Facebook!